Ann Goggins Gregory currently serves as the lead advisor to Habitat for Humanity International as it seeks to strengthen and renew its Support Model to 1300+ U.S. affiliates. In this capacity, she oversees all analysis associated with the current model, works to identify high-potential new offerings, and collaborates with affiliate and HFHI stakeholders to develop recommendations on the future approach. 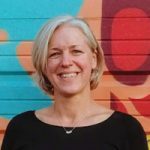 She has been with the Habitat network since 2014, when she joined Habitat Greater San Francisco as its first chief operating officer. In that role she oversaw programs (homeownership and neighborhood revitalization), impact measurement, the social enterprise ReStore, HR and operations. She spearheaded the organization’s strategic planning process, working with board and staff to define a bold new direction in one of the most challenging housing markets in the U.S. Previously, Ann was a senior director at the Bridgespan Group. In that role, she led the organization’s work on measurement and learning and spearheaded research efforts on various nonprofit management topics. She coauthored “The Nonprofit Starvation Cycle,” which appeared in the Stanford Social Innovation Review. Her articles on the importance of investment in “good overhead” – such as leadership development, knowledge sharing, and systems and infrastructure – have also appeared in the Harvard Business Review and the Chronicle of Philanthropy. Ann holds an undergraduate degree from the University of South Carolina, an MBA from the Kellogg School at Northwestern University and an MPA from Harvard’s Kennedy School of Government. She lives in the Bay Area with her husband, Will, and children, Harriet and Clark.